I’m not overly fond of books about war, but when Caroline announced that the April book for her Literature and War Readalong would be Helen Humphreys’ Coventry, I was immediately on board – for the obvious reason that it’s my home town 🙂 I’ll be posting a review of the book on the thirtieth, along with everyone else, but today I thought I’d take a little trip down memory lane and talk about some personal experiences, especially in connection with the cathedral. …where the new St. Michael’s Cathedral is connected to the old one by a covered walkway. 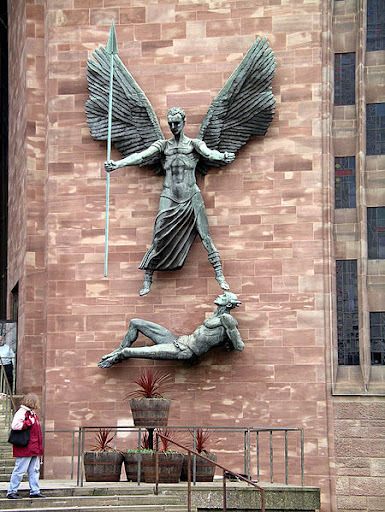 It’s best to approach the new cathedral from the ground-level steps though, taking in the size of the imposing building and pausing in front of the statue of St. Michael and the Devil, hovering above the wary visitor as both a welcome and a warning. The moment you step inside the new cathedral, your eyes are drawn to one thing, and one thing only. 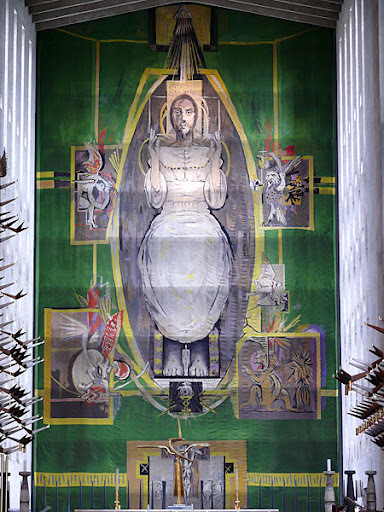 Directly opposite is the enormous Tapestry of Christ, designed by Graham Sutherland. It has to be seen to be believed, taking up the whole wall behind the altar, grabbing the attention of everyone who walks through the doors. …as, no doubt, you have already discovered if you’ve finished Humphreys’ book. I have wanted to read this book for the longest time! I didn't realise that this as the readalong book, otherwise I might have tried to join in! I meant to say thanks so much for sharing your memories of the cathedral. I really enjoyed reading your post. Thanks 🙂 My hometown is a fair bit smaller than Melbourne, so I've been to the cathedral a fair bit. As for the book.. Well, I'll be posting my review on Monday, but let's just say that it is probably more up your street than mine (which is surprising seeing as it's set in my hometown!). Thnaks for this, Tony, I enjoyed reading it. I have just finished the book and had your comment in my head the whole time while reading (you called it “light”). We can discuss it on Monday hopefully. I'll try to have the review up earlier than normal, Danille and TBM said they will be on time as well. Should be interesting. I would love to see the cathedral. I think I know what you meant when you called it light but as I just finished I have to think about it some more. Marg – if you see this. Should you have the book you could still join. We post on Monday but the discussion usullay runs a day or two. Sometimes people join much later. I would still link your review even if you are late. Not living far from Canterbury, my experiences are based around that, it survived the war & Henry II grievances with Thomas, so is still intact, it also survived me as a choirboy throwing up over the alter. Have seen footage of Coventry during the war & it's not nice. Caroline – 'Fluffy' would be another word 😉 I'm sure there'll be some people with *very* different opinions to mine though! Gary – See, now throwing up over the altar is a much more interesting anecdote! Gary – Probably not what was in mind when they said “'Tis better to give than to receive.'! 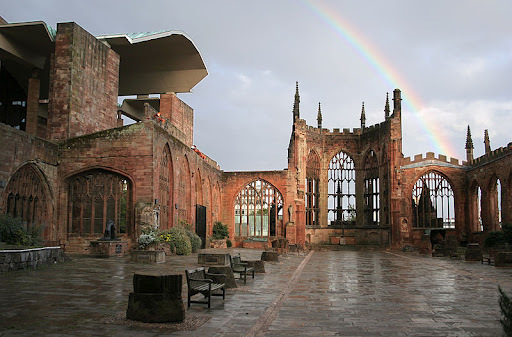 I visited Coventry cathedral once as a child – and was terrified. I can't quite remember what freaked me out, possibly the cross of nails or the statue of St Michael and the devil. Maryom – Probably the statue – I can easily see how that would be scary to a kid!